A RideKleen mobile vehicle-washing truck. Photo courtesy of Cox Automotive. The Cox Automotive Mobility Group launched a new brand on Sunday called Pivet that will provide a network of end-to-end mobility fleet services. The Pivet network will include both physical locations and mobile vehicle management solutions. The initial flagship hub location will be Manheim Metro Atlanta, which was previously an auto auction. The initial mobile fleet services offering will be provided by RideKleen, a mobile car care company that Cox Automotive purchased in October. The end-to-end services that Pivet would provide to fleets include: in-fleeting/de-fleeting, cleaning/detailing, maintenance, calibration, reconditioning, fueling/charging, storage/parking and logistics. 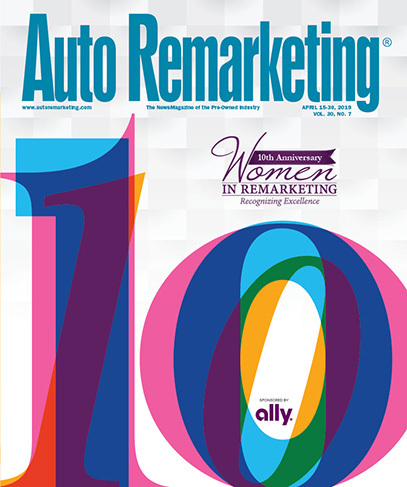 Joe George, who is president of the Cox Automotive Mobility Group, said in the release that these types of services are going to increase in importance, “as additional high-utilization commercial fleets are deployed, resulting in significant increases in miles per vehicle and a more frequent need for service and maintenance. “The creation of Pivet represents the evolution of our vision, and our group’s passion and commitment to powering fleets and other shared mobility operators of today and in the future,” he said. Echoing that sentiment, Alex Fraser — who is who is general manager of Atlanta Market Fleet Services — said in a phone interview last week that the company envisions fleet servicing as a “huge part of the car business” in both the near- and long-term future, given how these new forms of mobility bring an increase in the number of people using/sharing an individual vehicle. That, in turn, leads to additional mileage and necessary maintenance and care. For instance, services like rebalancing, an often-necessary task that ridesharing companies face each day after different users operate their vehicles, Fraser said. The hub is meant to “add spokes to it,” not all of which will be Cox Automotive properties, Fraser said. The first companies providing services in the hub are Cox entities (Manheim Metro Atlanta and RideKleen), but the plan is to also bring in companies that Cox partners with on the mobility side. Sharing more details about the first physical location for Pivet, the company said in a news release that Manheim Metro Atlanta, the former auto auction, now provides traditional fleet services to such clients as Lyft, Flex Fleet Rental, Hertz and Clutch. The fleet hub team there will also help develop advanced senor and electric vehicle technologies through innovation labs launching in 2019. The hub at Manheim Metro Atlanta will also provide a “consumer mobility lounge” where Lyft and Uber drivers can have their vehicles cleaned and serviced. There is also a partnership with Southern Company: Georgia Power, where they are working with Lyft and Electrify America in a project providing EV charging stations for ridesharing. In addition to more growth planned for the Manheim Metro Atlanta hub, the physical hub model is expected to launch at other Manheim locations and other properties this year. In the announcement of Pivet, Cox Automotive emphasizes that while the hub at Manheim Metro Atlanta hows how the company would utilize the footprint and service infrastructure of Manheim, the focus for Pivet will be developing mobile fleet services technology. Again, the initial launch of that will be headed up by RideKleen. The mobile car care company operates in Atlanta, Boston, Chicago, Los Angeles, New York, Philadelphia, Pittsburgh, San Diego, San Francisco and Washington, D.C. Its cleaning service clients include Getaround, Zipcar and Enterprise Car Share. Some of the RideKleen fleets will be able to provide light mechanical work like oil changes or other on-demand maintenance tasks. “One of the things that’s really unique about Pivet … is that we have these physical hub locations, but we do also have now in RideKleen, the mobile service offering and the ability to really make sure we’re helping fleet managers maximize vehicle up time and profitability with that mobile solution,” said Kristen Givens, who leads marketing for Cox Automotive Mobility, in last week’s phone interview. “So, whatever’s going to be most convenient and flexible or the client, we want to deliver service in that way,” she said. Speaking of Manheim locations, with Pivet’s hub launching at Manheim Metro Atlanta, what does that say about the role of physical auctions in the growing mobility landscape? Does it signal a change in how auctions can potentially operate, beyond buying and selling cars? “It’s not an ‘either-or’ — it’s an ‘and,’” Fraser said during the call, referring to an auction’s potential to play the traditional role as marketplace for buying/selling wholesale cars as well as the role of providing fleet servicing. “And I think that’s really important, because in certain markets we may do what we did with Metro Atlanta — and that is, close the auction as an auction and operate it as a mobility hub. But I would imagine in a lot of markets, probably most markets, we will look to co-locate with some of our Cox Automotive brands, primarily Manheim, because there’s absolutely still a huge market need for auto auctions, obviously, and that’s a big part of our business. “But a lot of these services can be facilitated out of an auction without really interrupting it,” he said. “And so we’re really excited about the efficiencies that can be seen there by multi-(purpose) use of the facilities. Some of our customers or clients that we’re already talking to around Pivet-type services and mobility services are thankful that we have these big facilities that are built to scale, because some of them have really grand plans about their growth, and they need scalable partners.